Zelda. Need I say more? Probably not, but you know the series. We grew up playing as Link and saving that Princess Zelda. All the fun of solving problems. Shared amongst my siblings as we all tried not to cheat, but yet wanted to get ahead in the game. I remember trading my own turn just for some help on beating a boss. 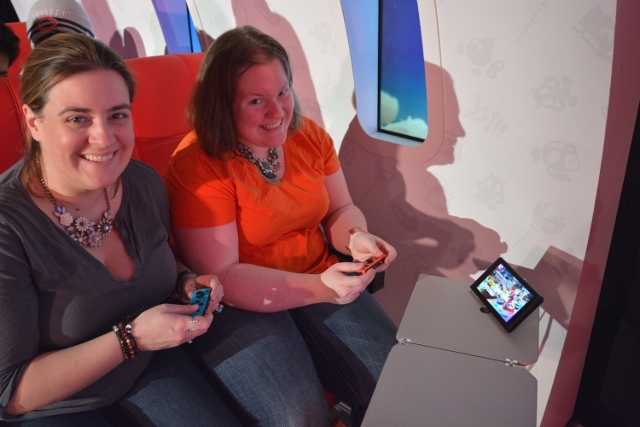 So, when we got invited to preview the Nintendo Switch, we said yes! As you know the system comes out tomorrow, March 3rd. Here is just a quick peek at some of the games you can play. 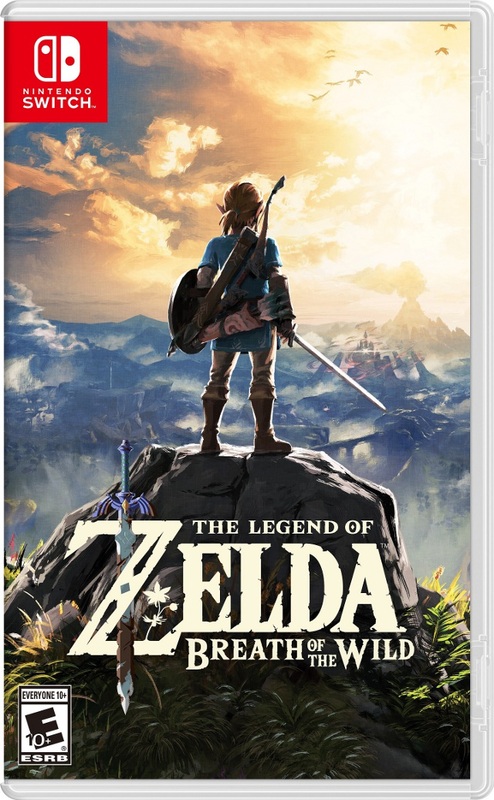 Of course, you know my favorite was The Legend of Zelda: Breath of the Wild. Typical of Zelda, you start with the basics. After finding some clothes, I managed to find a branch to use as a weapon. Upon entering the wilds, the game is all about building yourself back up to the hero of legend. The game play is slightly more challenging as you can just endlessly wander. However, the game isn’t aimless, you still have tasks to accomplish. When you get around to them is your choice. The most interesting part is that all those hours playing together on the same couch rubbed off. The staff helping us play told us that our styles are exactly the same. I look over at my sister’s screen and we were in exactly the same place. We died in the same place at the same time too. Before we had the chance to become Link, we got a closer look at the system. 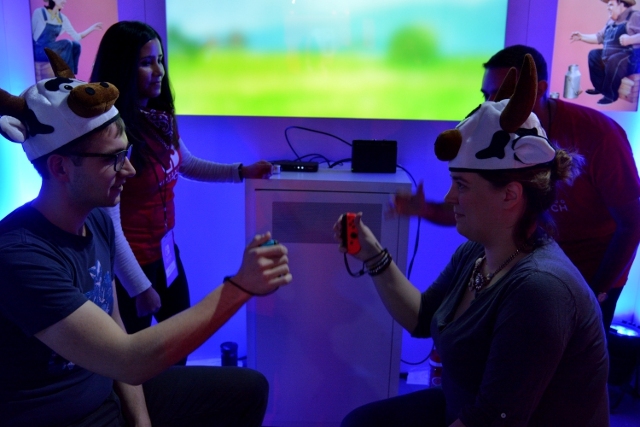 1-2 Switch is a great game to familiarize yourself with the capabilities of the Nintendo Switch. Those controllers are crazy sensitives. There’s a game where you guess how many marbles you’re holding. You can feel the individual balls rolling around inside the controller. 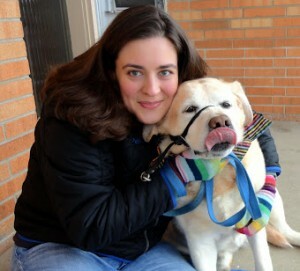 The experience had us so taken aback that we guessed too high because it didn’t seem right. How could I feel 2 individual balls rolling around? That’s not the only minigame. As you can see, milking the cows can be done by us city folk as well. Although I think those of us that have milked a cow might actually have a leg up on our competition. Arms is another crowd favorite. There’s something about virtual boxing that just feels right. No one really gets hurt besides maybe a bruised ego. However, you can still get a workout with those punches. Something you have probably felt if you have boxed with the Nintendo Wii. Arms is all about choosing your arms. Each one can be different with special powers. 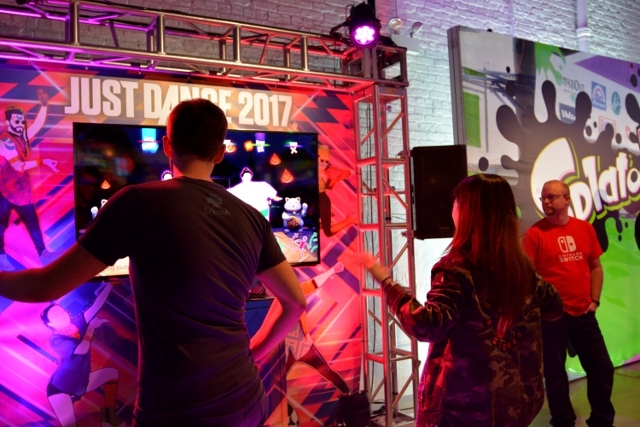 Just Dance 2017 is up there with game you’ll love to play with your friends. You can add up to 6 players. Lucky for me, I happen to know a great dancer. So good that they wanted to scout her for the main stage. With ease of course because the Nintendo Switch is compact. You can take the system with you. The controllers can be used in a pair or split up. For games like Arms you need 2 hands to punch. While for Mario Kart 8 Deluxe you can either grab one of the controllers or you can play all together with your own Nintendo Switch. There is even Smart Steering so young kids or people new to the game can stay on the track! All of this makes Mario Kart a family favorite. When it comes down to it though that Battle Mode is even sweeter than before with Bob-omb Blast. That’s just a quick peek at what lies in store for you with the Nintendo Switch. On the go or playing at home, the options are endless. Nintendo has packed all the usual fun inside and added a few twists. With better precision than before you can dance or battle or race all of your friends. 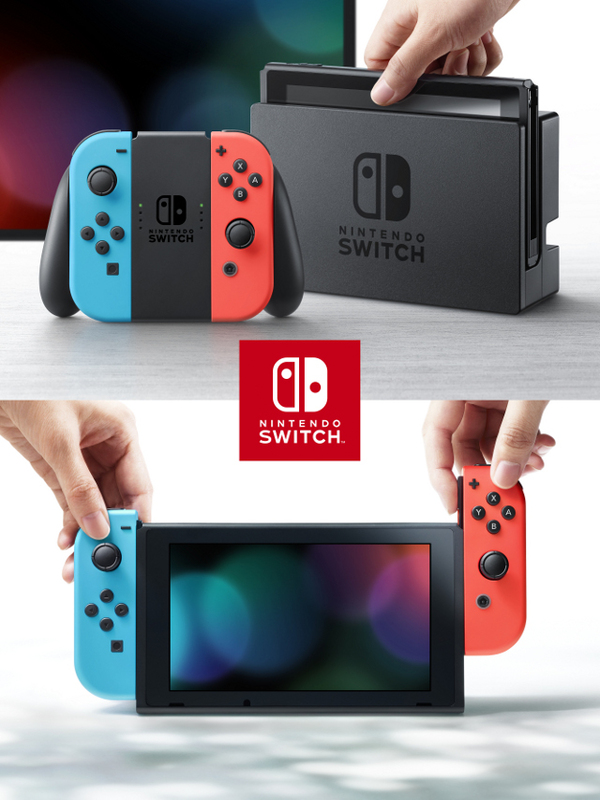 With games like 1-2 Switch which are all about your opponent rather than the screen, Nintendo is changing the way in which we game yet again. You can learn even more from the official website. The Nintendo Switch is definitely a great addition to a family night dinner. I look forward to playing together with more people.